When I first started cloth diapering, I thought the most difficult part of cloth diapering was figuring out the right laundry routine. If you start researching online or talking to people, you’ll find a myriad of different ways to launder your cloth diapers. Initially, I found it all overwhelming. As time has passed, I’ve realized it’s really not that difficult. It’s not something to get intimidated by, at least. Try a few different things out. You’ll figure out what works for you! Before you even start washing your diapers, you need to decide how you’ll store the dirty diapers and get them to the wash. Some parents use a wet bag, but most wet bags can’t stand on their own. You’ll have to hang it or let it flop around until there are enough dirty diapers in it to hold it up. You could use a pail specifically designed for cloth diapers like this Cloth Diaper Pail with filters. I use a trash can from Walmart with a pail liner inside. I rotate through two pail liners I bought from Diaper Junction: one by Planetwise and one by Rump-A-Rooz. They’re both great pail liners. If you’re going to use a pail, determine whether you’ll use a dry pail or wet pail method. I use a dry pail, because I was concerned about a drowning hazard. Also, I’m really clutzy, and I could totally see myself dumping over a wet pail filled with gross poop water. You can buy pail deodorizers to keep the smell down or make your own. Other parents sprinkle baking soda in the pail or wet bag. If you do this, make sure you sprinkle it on the bottom of the pail or bag before you start adding dirty diapers. Some diaper manufacturers recommend that you sprinkle baking soda directly on their diapers, but just check with the manufacturers first. Baking soda directly on a diaper could damage the fabric. I spray all poopy diapers with Biokleen Bac-Out before I toss them in the diaper pail. This does a good job of eliminating smells. It also eliminates at least half the stains. Since Bac-Out uses enzymes, using it will void certain diaper warranties, so do your research beforehand. I haven’t had any issues with it though. I’ve been spraying Bac-Out on natural fiber diapers regularly for over a year, and there doesn’t appear to be any damage to the fabric. Once a month, I use RLR Laundry Treatment in the wash. At the beginning of the wash cycle, I open the RLR packet and dump the powder along with detergent straight on my laundry. The RLR brightens laundry and also helps with any stink, repelling, or build-up issues that my diapers may have. If you’re planning on cloth diapering, I recommend stocking up on a few packets of RLR. I usually wash every two to three days and set the machine’s water level to maximum. Once a week I wash on hot to make sure the diapers get really clean and any bacteria has been killed. I don’t wash on hot every time, though, because hot water wears down fabric, especially PUL. Line dry all diaper covers. Dry all other diapers, inserts, doublers, wet bags, and pail liners on low heat in dryer for 20 minutes. Remove pocket diapers sans inserts from dryer and finish drying on line. Continue drying everything else in dryer on high. If you live in a dry climate, you may be able to dry everything outside in the sun. In the area where we currently live, I can’t do that, unfortunately. It’s too humid. I’ve had mildew start growing on diapers and inserts that I’ve line dried. I do recommend drying the pocket diapers and covers in the sun whenever possible, with the insides facing the rays. The sun naturally fades stains, and it kills bacteria! If it’s raining outside, I hang the pockets and covers on a drying rack under an A/C or heat unit inside our home. Dryer balls are a great thing to add to your diapers in the dryer. Although I’ve read conflicting reports on whether or not dryer balls reduce drying time, in my opinion they do soften diapers and reduce static electricity. And that’s my regular routine! How about you? Do you cloth diaper? What’s your routine? Great tips – a friend is about to have a baby and was wondering about this!! Oh good! I’m glad to help. 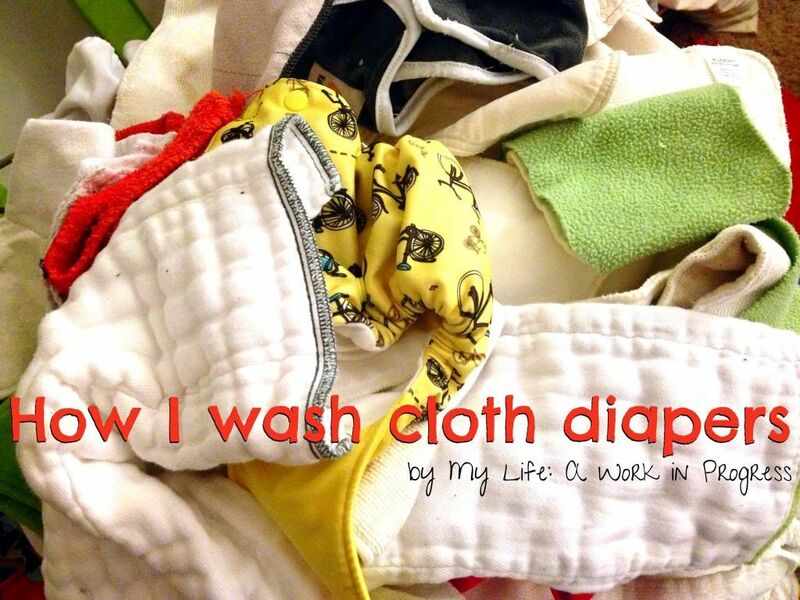 I never knew it was possible to wash cloth diapers – thanks for the post! Thank you for sharing this article. So many people are afraid of cloth diapers and this will help ease their mind. Wow! Lot’s of great info in this post! Thanks for going into such detail and including some brands you’ve tried. That helps a lot when deciding on what items to consider.